The ACR1255U from ACS is a 13.56 MHz USB contactless smartcard reader that has been designed to support on-the-go smartcard and NFC applications. Featuring Bluetooth Smart connectivity (Bluetooth Low Energy), this extremely portable reader is ideal for use with most Bluetooth-enabled devices including smartphones and tablets. The ACR1255U supports ISO 14443 Type A and B smartcards, as well as MIFARE, FeliCa, and most ISO 18092 compliant NFC tags and devices, running Android (4.3 and later), iOS (5.0 and later), Windows (7 and later) and Mac OS (10.7 and later). PC/SC and CCID compliant, this reader supports all major operating systems including Windows, Linux and Mac OS. 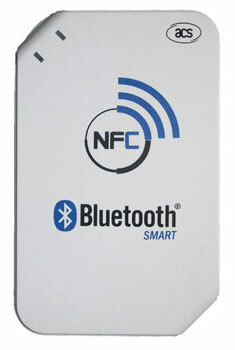 Ideal for a broad range of applications, including physical and logical access control, inventory tracking and hands-free verification, the ACR1255U Bluetooth NFC reader features an elegantly compact design and a rechargeable Lithium-ion battery.